I'd been seeing this New Bright Hummer H3T in stores for awhile, but never could quite motivate myself to try it until I caught it on sale. It wasn't until I got it home, though, that I realized it comes with all the batteries you need to run it, including a rechargable pack for the truck itself, and a wall charger! Suddenly what previously seemed like an iffy deal now seemed like a great one. Since everything you need is included, you just need to follow the instructions to get charged up and install the batteries. 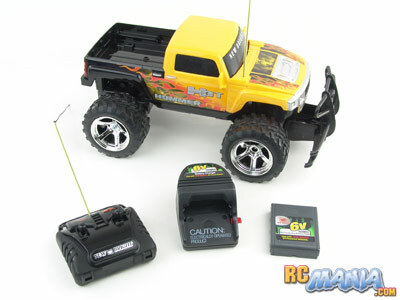 Oh, and you also need to install antenna tubes on both the truck and the controller, otherwise the wires will just flop around and can get caught in things. Tie a single knot in the wire right at the top of each tube to make sure they don't pull out accidentally. When I first started driving the New Bright Hummer H3T, I was completely satisfied with it. It's designed with younger kids in mind, and as such it has a small controller and its speed is modest. It seemed to do what it's meant to do. However, as I kept driving, I started trying it over some dirt and on very, very gentle inclines, and it slowed down a lot. It seems the motor just doesn't have enough power to get over much rough terrain, and even going up a normal driveway, it starts to strain. It does pull through a lot of things, but it can start going really, really slow. Going downhill its speed seems to double, which is just more evidence that the motor is underpowered. I'd actually be worried about younger kids wanting to drive downhill all the time to go faster, which can lead them right down a driveway and out to the sidewalk or even the curb where it's not safe. 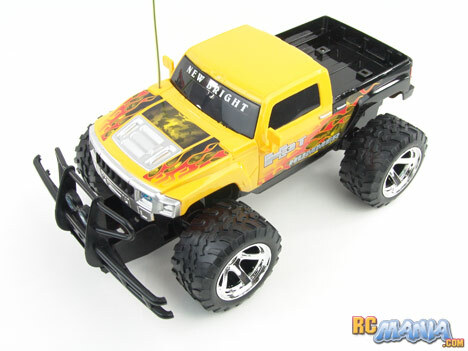 New Bright tries to give you a good deal with their 1/15th scale RC Hummer H3T by including a battery & charger, and even AA's for the controller. The truck actually works great on hard, flat ground, and seems ideal for kids in the 5 to 7 year old range, for either indoor or outdoor use. However, when you throw even the slightest hint of a hill at it, or try to drive it over either really bumpy dirt or high-pile carpeting, it slows to a crawl and can actually get stuck sometimes. I really found this disappointing, and would rather have sacrificed a little more speed for better gearing that would give more torque to get over things, especially with such big tires. For a kid who will only be driving around indoors on flat ground -- either a hard floor or low carpet -- the New Bright Hummer H3T is fine, and a good value. For outdoor use on anything other than flat hard ground, pass on it.